Are you tired of reviewers and tech personalities like myself going on and on about how Coffee Lake changed the game and how great six cores and twelve threads are, and the joyous end of the long reign of the quad core? If you are, you're in luck because today, I have something different, something better; if you aren't, you're still in luck because this is even more exciting. Now, just one short year after Intel launched their 8th Generation Core processors and broke the mainstream meta that they had maintained for so long, the brand is ready to shake things up once again. Before you get too excited, I must inform you that actual details and benchmarks of Intel's new 9000 series are still under embargo, so this preview only details the new Z390 chipset and the boards that host it. Don't go away yet, though, as MSI provided me with a truly epic board to show off for this launch. The MEG Z390 GODLIKE is the flagship of flagships for the gaming-centric brand, and any feature you can imagine, MSI not only included with this board as it has also been turned up to eleven. Before I get into the details of the Z390 chipset, and the MEG Z390 GODLIKE in particular, I want to clarify the changes made to the MSI naming scheme and the intent behind them. Starting with this generation of boards in both the mainstream and HEDT segments, MSI motherboards will be sorted into four categories: the MEG series, MPG series, MAG series, and PRO series. The first three, which are new designations, are acronyms (M.E.G., M.P.G., and M.A.G.). The punctuation has been left out in order to accommodate inventory management systems that may have trouble with punctuation symbols. MSI intends these segments to sort boards based on features instead of price. So what can consumers expect from each category? The MEG (MSI Enthusiast Gaming) series boards boast the most advanced technologies, specifically for this launch. The two MEG models (the GODLIKE and ACE) feature Killer network controllers, a dedicated audio DAC, and an infinity mirror RGB light zone. 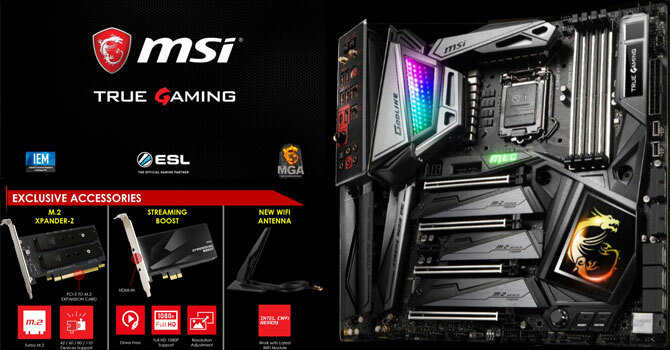 The MPG (MSI Performance Gaming) series is designed around the mainstream gaming market, both in features and aesthetic design. The MAG (MSI Arsenal Gaming) series focuses on pure functionality and is designed to have a rugged military aesthetic. The PRO series, which is not new, covers all boards designed for home or business use. These boards will not feature support for the MSI software suite that is included with the other three categories of motherboard. Now that all of that is cleared up, let's get to what the Z390 chipset changes from last year's Z370. 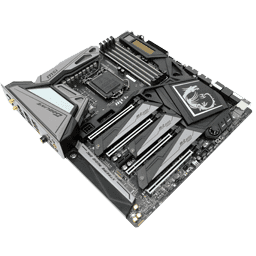 As you would guess from the nomenclature, Z390 is a refresh chipset rather than something brand new, but there are some interesting improvements. First, USB 3.1 Gen2 is now natively supported, where on the Z370 chipset, motherboard manufacturers would need to use third party storage controllers. The second major change is CNVi support, which is Intel's high speed wireless solution. The 2x2 802.11ac connection boasts up to 1.73 Gb/s throughput. The Z390 chipset is compatible with 8th Gen Core processors as well. The MEG Z390 GODLIKE has so many features, and this intro is already getting long, so I'll be brief here and let you dig into the juicy details further on. The MEG Z390 GODLIKE is MSI's top dog, specifically designed to cater to enthusiasts who want it all, and the board features several extras targeted towards streamers. Basically, MSI took a look at the best enthusiast features and pumped them up to eleven.